"Grey Wolf" and "Gray Wolf" redirect here. For other uses, see Grey Wolf (disambiguation). The wolf (Canis lupus),[a] also known as the grey/gray wolf or timber wolf, is a canine native to the wilderness and remote areas of Eurasia and North America. It is the largest extant member of its family, with males averaging 43–45 kg (95–99 lb) and females 36–38.5 kg (79–85 lb). It is distinguished from other Canis species by its larger size and less pointed features, particularly on the ears and muzzle. Its winter fur is long and bushy and predominantly a mottled gray in color, although nearly pure white, red and brown to black also occur. Mammal Species of the World (3rd ed., 2005), a standard reference work in zoology, recognises 38 subspecies of C. lupus. The gray wolf is the second most specialized member of the genus Canis, after the Ethiopian wolf, as demonstrated by its morphological adaptations to hunting large prey, its more gregarious nature, and its highly advanced expressive behavior. It is nonetheless closely related enough to smaller Canis species, such as the coyote, and golden jackal, to produce fertile hybrids. 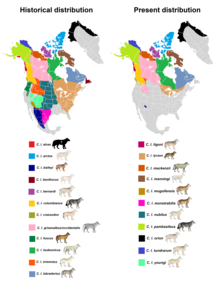 It is the only species of Canis to have a range encompassing both Eurasia and North America, and originated in Eurasia during the Pleistocene, colonizing North America on at least three separate occasions during the Rancholabrean. It is a social animal, travelling in nuclear families consisting of a mated pair, accompanied by the pair's adult offspring. The gray wolf is typically an apex predator throughout its range, with only humans and tigers posing a serious threat to it. It feeds primarily on large ungulates, though it also eats smaller animals, livestock, carrion, and garbage. A seven-year-old wolf is considered to be relatively old, and the maximum lifespan is about 16 years. The species Canis lupus was first recorded by Carl Linnaeus in his publication Systema Naturae in 1758, with the Latin classification translating into the English words "dog wolf". 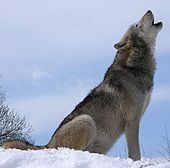 The 37 subspecies of Canis lupus are listed under the designated common name of "wolf" in Mammal Species of the World (third edition) that was published in 2005. The nominate subspecies is the Eurasian wolf (Canis lupus lupus), also known as the common wolf. The subspecies includes the domestic dog, dingo, eastern wolf and red wolf, but lists C. l. italicus as a synonym of C. l. lupus. However, the classification of several as either species or subspecies has recently been challenged. The evolution of the wolf occurred over a geologic time scale of at least 300,000 years. The gray wolf Canis lupus is a highly adaptable species that is able to exist in a range of environments and which possesses a wide distribution across the Holarctic. Studies of modern gray wolves have identified distinct sub-populations that live in close proximity to each other. This variation in sub-populations is closely linked to differences in habitat – precipitation, temperature, vegetation, and prey specialization – which affect cranio-dental plasticity. In 2018, whole genome sequencing was used to compare members of the genus Canis, along with the dhole (Cuon alpinus) and the African hunting dog (Lycaon pictus). There is evidence of gene flow between African golden wolves, golden jackals, and gray wolves. One African golden wolf from the Egyptian Sinai Peninsula showed high admixture with the Middle Eastern gray wolves and dogs, highlighting the role of the land bridge between the African and Eurasian continents in canid evolution. 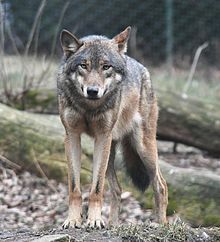 There was evidence of gene flow between golden jackals and Middle Eastern wolves, less so with European and Asian wolves, and least with North American wolves. The study proposes that the golden jackal ancestry found in North American wolves may have occurred before the divergence of the Eurasian and North American gray wolves. The study indicates that the common ancestor of the coyote and gray wolf has genetically admixed with a ghost population of an extinct unidentified canid. The canid is genetically close to the dhole and has evolved after the divergence of the African hunting dog from the other canid species. The basal position of the coyote compared to the wolf is proposed to be due to the coyote retaining more of the mitochondrial genome of this unknown canid. 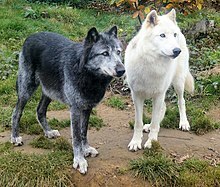 It was once thought that dogs and gray wolves did not voluntarily interbreed in the wild, though they can produce fertile wolf-dog offspring. In 2010, a study of 74 Italian wolf male lineages found that 5 of them originated from dog ancestry, indicating that female wolves will breed with stray male dogs in the wild. In North America, black colored wolves acquired their coloration from wolf-dog hybridization, which occurred 10,000–15,000 years ago. Like pure wolves, hybrids breed once annually, though their mating season occurs three months earlier, with pups mostly being born in the winter period, thus lessening their chances of survival. However, one genetic study undertaken in the Caucasus Mountains showed that as many as 10% of dogs in the area, including livestock guardian dogs, are first generation hybrids. The captive breeding of wolf-dog hybrids has proliferated in the United States, where there is an estimated population of 300,000. 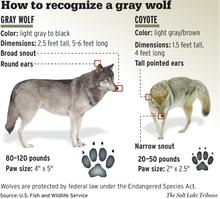 Compared to its closest wild cousins (the coyote and golden jackal), the gray wolf is larger and heavier, with a broader snout, shorter ears, a shorter torso and longer tail. It is a slender, powerfully built animal with a large, deeply descending ribcage, a sloping back and a heavily muscled neck. The wolf's legs are moderately longer than those of other canids, which enables the animal to move swiftly, and allows it to overcome the deep snow that covers most of its geographical range. The ears are relatively small and triangular. Females tend to have narrower muzzles and foreheads, thinner necks, slightly shorter legs and less massive shoulders than males. The gray wolf's head is large and heavy, with a wide forehead, strong jaws and a long, blunt muzzle. The skull averages 230–280 mm (9.1–11.0 in) in length, and 130–150 mm (5.1–5.9 in) wide. The teeth are heavy and large, being better suited to crushing bone than those of other extant canids, though not as specialised as those found in hyenas. Its molars have a flat chewing surface, but not to the same extent as the coyote, whose diet contains more vegetable matter. The gray wolf's jaws can exert a crushing pressure of perhaps 10,340 kPa (1,500 psi) compared to 5,200 kPa (750 psi) for a German Shepherd. This force is sufficient to break open most bones. A study of the estimated bite force at the canine teeth of a large sample of living and fossil mammalian predators when adjusted for the body mass found that for placental mammals, the bite force at the canines (in Newtons/kilogram of body weight) was greatest in the extinct dire wolf (163), then followed among the extant canids by the four hypercarnivores that often prey on animals larger than themselves: the African hunting dog (142), the gray wolf (136), the dhole (112), and the dingo (108). A similar trend was found with the carnassial tooth bite force, but with the extinct dire wolf and gray wolf both measuring (141), then followed by the African hunting dog (136), the dhole (114), and the dingo (113). The gray wolf is a habitat generalist, and can occur in deserts, grasslands, forests and arctic tundras. Habitat use by gray wolves is strongly correlated with the abundance of prey, snow conditions, absence or low livestock densities, road densities, human presence and topography. In cold climates, the gray wolf can reduce the flow of blood near its skin to conserve body heat. The warmth of the footpads is regulated independently of the rest of the body, and is maintained at just above tissue-freezing point where the pads come in contact with ice and snow. Gray wolves use different places for their diurnal rest: places with cover are preferred during cold, damp and windy weather, while wolves in dry, calm and warm weather readily rest in the open. During the autumn-spring period, when wolves are more active, they willingly lie out in the open, whatever their location. Actual dens are usually constructed for pups during the summer period. When building dens, females make use of natural shelters such as fissures in rocks, cliffs overhanging riverbanks and holes thickly covered by vegetation. Sometimes, the den is the appropriated burrow of smaller animals such as foxes, badgers or marmots. An appropriated den is often widened and partly remade. On rare occasions, female wolves dig burrows themselves, which are usually small and short with 1–3 openings. The den is usually constructed not more than 500 m (550 yd) away from a water source, and typically faces southwards, thus ensuring enough sunlight exposure, keeping the denning area relatively snow free. Resting places, play areas for the pups and food remains are commonly found around wolf dens. The odour of urine and rotting food emanating from the denning area often attracts scavenging birds such as magpies and ravens. As there are few convenient places for burrows, wolf dens are usually occupied by animals of the same family. Though they mostly avoid areas within human sight, wolves have been known to nest near domiciles, paved roads and railways. Although wolves primarily feed on medium to large sized ungulates, they are not fussy eaters. Smaller sized animals that may supplement the diet of wolves include marmots, hares, badgers, foxes, weasels, ground squirrels, mice, hamsters, voles and other rodents, as well as insectivores. They frequently eat waterfowl and their eggs. When such foods are insufficient, they prey on lizards, snakes, frogs, rarely toads and large insects as available. 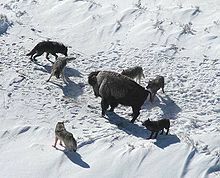 In times of scarcity, wolves readily eat carrion, visiting cattle burial grounds and slaughter houses. 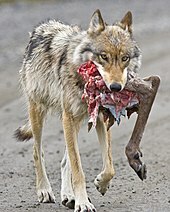 Cannibalism is not uncommon in wolves: during harsh winters, packs often attack weak or injured wolves, and may eat the bodies of dead pack members. Wolf packs in Astrakhan hunt Caspian seals on the Caspian Sea coastline and some wolf packs in Alaska and Western Canada have been observed to feed on salmon. Wolves in northern Minnesota have also been observed hunting northern pike in freshwater streams. Humans are rarely, but occasionally preyed upon. Other primates occasionally taken by wolves include grey langurs in Nepal and hamadryas baboons in Saudi Arabia. Gray wolves typically dominate other canid species in areas where they both occur. 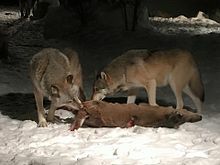 In North America, incidents of gray wolves killing coyotes are common, particularly in winter, when coyotes feed on wolf kills. 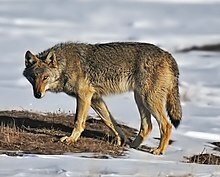 Wolves may attack coyote den sites, digging out and killing their pups, though rarely eating them. There are no records of coyotes killing wolves, though coyotes may chase wolves if they outnumber them. Near identical interactions have been observed in Eurasia between gray wolves and golden jackals, with the latter's numbers being comparatively small in areas with high wolf densities. Gray wolves are the most important predator of raccoon dogs, killing large numbers of them in the spring and summer periods. Wolves also kill red, arctic and corsac foxes, usually in disputes over carcasses, sometimes eating them. In Asia, they may compete with dholes, though there is at least one record of a lone wolf associating with a pair of dholes in Debrigarh Wildlife Sanctuary. Brown bears typically dominate wolf packs in disputes over carcasses, while wolf packs mostly prevail against bears when defending their den sites. Both species kill each other's young. Wolves eat the brown bears they kill, while brown bears seem to only eat young wolves. Wolf interactions with American black bears are much rarer than with brown bears, because of differences in habitat preferences. The majority of black bear encounters with wolves occur in the species' northern range, with no interactions being recorded in Mexico. Wolves have been recorded on numerous occasions to actively seek out black bears in their dens and kill them without eating them. Unlike brown bears, black bears frequently lose against wolves in disputes over kills. While encounters with brown and black bears appear to be common, polar bears are rarely encountered by wolves, though there are two records of wolf packs killing polar bear cubs. Wolves also kill the cubs of Asian black bears. Wolves may encounter striped hyenas in Israel, Central Asia and India, usually in disputes over carcasses. Striped hyenas feed extensively on wolf-killed carcasses in areas where the two species interact. One-to-one, hyenas dominate wolves, and may prey on them, but wolf packs can drive off single or outnumbered hyenas. However, there was a case of a female striped hyena dominating 12 Arabian wolves. Two cases are known however from southern Israel, where wolves and striped hyenas associated closely with each other in an apparently amicable way. Large wolf populations limit the numbers of small to medium-sized felines. Wolves encounter cougars along portions of the Rocky Mountains and adjacent mountain ranges. Wolves and cougars typically avoid encountering each other by hunting on different elevations. In winter, however, when snow accumulation forces their prey into valleys, interactions between the two species become more likely. Wolves in packs usually dominate cougars and can steal kills. They have been reported killing mothers and their kittens. Wolves hunt steppe cats, and may scavenge from snow leopard kills. Wolves may also reduce Eurasian lynx populations. Wolves may kill lynxes by running them down, or killing them before they can escape into trees. Similar reports of encounters between wolves and bobcats have been documented. Leftovers of wolf kills are sometimes scavenged by wolverines. Wolverines usually wait until the wolves are done feeding, but have been known to drive away wolves from kills. However, there have been confirmed reports of wolf packs killing wolverines. In 1978, wolves began recolonising central Sweden after a twelve-year absence, and have since expanded into southern Norway. As of 2005, the total number of Swedish and Norwegian wolves is estimated to be at least one hundred, including eleven breeding pairs. The gray wolf is fully protected in Sweden and partially controlled in Norway. The Scandinavian wolf populations owe their continued existence to neighbouring Finland's contiguity with the Republic of Karelia, which houses a large population of wolves. 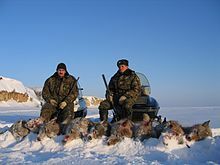 Wolves in Finland are protected only in the southern third of the country, and can be hunted in other areas during specific seasons, though poaching remains common, with 90% of young wolf deaths being due to human predation, and the number of wolves killed exceeds the number of hunting licenses, in some areas by a factor of two. Furthermore, the decline in the moose populations has reduced the wolf's food supply. Since 2011, the Netherlands, Belgium and Denmark have also reported wolf sightings presumably by natural migration from adjacent countries. In 2016, a female wolf tracked 550 kilometers from a region southwest of Berlin to settle in Jutland, Denmark where male wolves had been reported in 2012 for the first time in 200 years. Wolves have also commenced breeding in Lower Austria's Waldviertel region for the first time in over 130 years. Wolves are often infested with a variety of arthropod exoparasites, including fleas, ticks, lice, and mites. The most harmful to wolves, particularly pups, is Sarcoptes scabiei (or mange mite), though they rarely develop full blown mange, unlike foxes. Lice, such as Trichodectes canis, may cause sickness in wolves, but rarely death. Ticks of the genus Ixodes can infect wolves with Lyme disease and Rocky Mountain spotted fever. The tick Dermacentor pictus also infests wolves. Other ectoparasites include biting lice, sucking lice and the fleas Pulex irritans and Ctenocephalides canis. Endoparasites known to infect wolves include protozoans and helminths (flukes, tapeworms, roundworms and thorny-headed worms). Of 30,000 protozoan species, only a few have been recorded to infect wolves: Isospora, Toxoplasma, Sarcocystis, Babesia, and Giardia. Wolves may carry Neospora caninum, which is of particular concern to farmers, as the disease can be spread to livestock, with infected animals being 3–13 times more likely to miscarry than those not infected. Among flukes, the most common in North American wolves is Alaria, which infects small rodents and amphibians that are eaten by wolves. 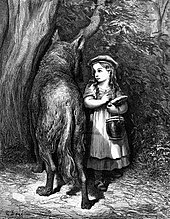 Upon reaching maturity, Alaria migrates to the wolf's intestine, but harms it little. Metorchis conjunctus, which enters wolves through eating fish, infects the wolf's liver or gall bladder, causing liver disease, inflammation of the pancreas, and emaciation. Most other fluke species reside in the wolf's intestine, though Paragonimus westermani lives in the lungs. Tapeworms are commonly found in wolves, as their primary hosts are ungulates, small mammals, and fish, which wolves feed upon. Tapeworms generally cause little harm in wolves, though this depends on the number and size of the parasites, and the sensitivity of the host. Symptoms often include constipation, toxic and allergic reactions, irritation of the intestinal mucosa, and malnutrition. 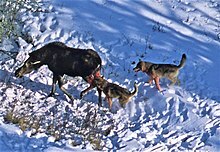 Infections by the tapeworm Echinococcus granulosus in ungulate populations tend to increase in areas with high wolf densities, as wolves can shed Echinoccocus eggs in their feces onto grazing areas. Wolves can carry over 30 roundworm species, though most roundworm infections appear benign, depending on the number of worms and the age of the host. Ancylostoma caninum attaches itself on the intestinal wall to feed on the host's blood, and can cause hyperchromic anemia, emaciation, diarrhea, and possibly death. Toxocara canis, a hookworm known to infect wolf pups in utero, can cause intestinal irritation, bloating, vomiting, and diarrhea. Wolves may catch Dioctophyma renale from minks, which infects the kidneys, and can grow to lengths of 100 cm. D. renale causes the complete destruction of the kidney's functional tissue, and can be fatal if both kidneys are infected. Wolves can tolerate low levels of Dirofilaria immitis for many years without showing any ill effects, though high levels can kill wolves through cardiac enlargement and congestive hepatopathy. Wolves probably become infected with Trichinella spiralis by eating infected ungulates. Although T. spiralis isn't known to produce clinical signs in wolves, it can cause emaciation, salivation, and crippling muscle pains in dogs. Thorny-headed worms rarely infect wolves, though three species have been identified in Russian wolves: Nicolla skrjabini, Macrocantorhynchus catulinus, and Moniliformis moniliformis. ^ a b c Wozencraft, C. W. (2005). 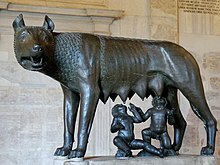 "Order Carnivora". In Wilson, D. E.; Reader, D. M. Mammal Species of the World: A Taxonomic and Geographic Reference. 1 (3 ed.). Johns Hopkins University Press. ISBN 978-0-8018-8221-0. ^ Young, S.P. and E.A. Goldman (1944). The Wolves of North America, Part I and II, Dover Publications Inc. New York. 636pp. ^ Hailer, F.; Leonard, J. A. (2008). Harpending, Henry, ed. "Hybridization among Three Native North American Canis Species in a Region of Natural Sympatry". PLOS One. 3 (10): e3333. Bibcode:2008PLoSO...3.3333H. doi:10.1371/journal.pone.0003333. PMC 2556088. 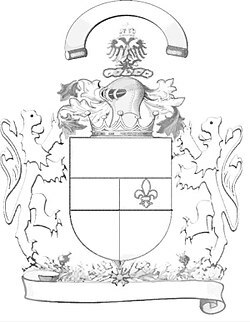 PMID 18841199. ^ Randi, Ettore (2007). 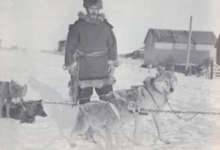 "Ch 3.4 – Population genetics of wolves (Canis lupus)". In Weiss, Steven; Ferrand, Nuno. Phylogeography of Southern European Refugia. Springer. pp. 118–121. ISBN 978-1-4020-49033.